Living a Fit and Full Life: Clean Like Never Before with the Dyson Cyclone V10 Absolute Vacuum! Clean Like Never Before with the Dyson Cyclone V10 Absolute Vacuum! Clean like never before with the Dyson Cyclone V10 Absolute Vacuum! I bought my first Dyson Vacuum probably at least 10 years ago and while it's been passed down to my mom, that thing is still an amazing vacuum. Since then, Dyson has been hard at work creating vacuums that are not only convenient but far more efficient which says a lot since even the early vacuums were and still are pretty amazing! 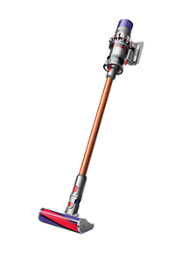 The Dyson Cyclone V10 Absolute Vacuum is an amazingly powerful vacuum that truly does it all! It comes with 4 tools to effectively clean my whole house with ease. I also love that there's three power modes so you can have just the right power for any job. The drop-in docking makes it extremely easy to grab and clean up little messes here and there so your floors stay cleaner for longer. And, if all that wasn't enough it's cord free so you can take it anywhere with ease. It's perfect for around the house and even works great to clean up messes in my messy mini van. 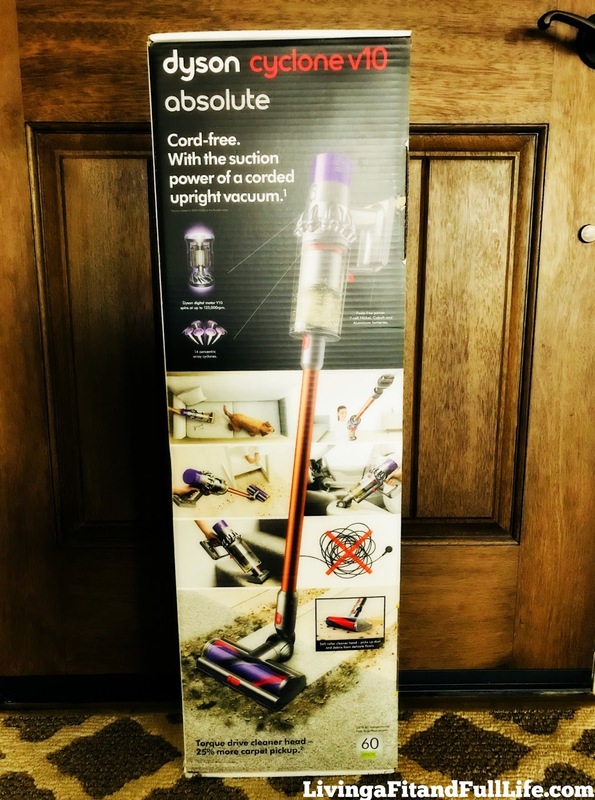 I was over the moon to try the new Dyson Cyclone V10 Absolute Vacuum and within just a few seconds of using it, I was extremely impressed. My carpet is only about a year old but was looking extremely compacted and worn. As soon as the Dyson Cyclone V10 Absolute Vacuum passed over the carpet it was revived. The carpet looked fluffy and brand new again. I was also extremely impressed with how much dirt, hair and other debris were in the dust bin, especially because I thought my carpet was already clean. Another thing to love is how extremely easy the dirt bin is to empty. Simply hold it over the trash, push the red lever down and it all empties into the trash. It even has a rubber insert to scrape off all the hair and dust each time it empties to give you max suction power every time. Dyson Cyclone V10 Absolute Vacuum is also phenomenal on bare floors and has now become my go to way to clean them. So much so that I no longer even have a broom and dustpan in my kitchen. The Dyson Cyclone V10 Absolute Vacuum picks up every crumb and then some off my floors. Also, because it's so easy to use, I'm able to keep my floors cleaner by pulling it out after every meal and giving my kitchen floors a quick cleaning. 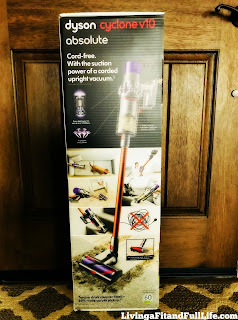 I've also used the Dyson Cyclone V10 Absolute Vacuum to clean my couches and mattresses and let me tell you, it's a must have for cleaning those items. I used the mini motorized tool and was absolutely disgusted with what was in the dirt bin. I keep a mattress protector on my mattresses at all times due to having little kids so I didn't think they were dirty, but boy was I wrong. The amount of gray dust that was in the dirt bin kinda made me gag a bit. I then used it on my couches and was even more disgusted. What was in the dirt bin was an extremely fine gray dust and I ended up having to empty the dust bin a few times. I now have couch vacuuming on my weekly cleaning schedule. I'm hoping all the dust was just from recently having the backyard landscaped but odds are that couch was filled with microscopic things I don't even want to think about. The Dyson Cyclone V10 Absolute Vacuum is an absolute must have, and while it might be somewhat expensive, it's definitely worth it to know your cleaning efforts are being matched with cleaning power when you use this vacuum! 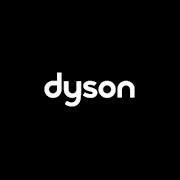 Click HERE to learn more about Dyson! Follow Dyson on social media!